The Fifty-first United States Congress, referred to by some critics as the Billion Dollar Congress, was a meeting of the legislative branch of the United States federal government, consisting of the United States Senate and the United States House of Representatives. It met in Washington, D.C., from March 4, 1889, to March 4, 1891, during the first two years of the administration of U.S. President Benjamin Harrison. The apportionment of seats in this House of Representatives was based on the Tenth Census of the United States in 1880. Both chambers had a Republican majority. This marked the first time since the 43rd United States Congress that both chambers were controlled by the president's party. Benjamin Harrison and the Congress are portrayed as a "Billion-Dollar Congress," wasting the surplus in this cartoon from Puck. It was responsible for a number of pieces of landmark legislation, many of which asserted the authority of the federal government. Emboldened by their success in the elections of 1888, the Republicans enacted virtually their entire platform during their first 303-day session, including a measure that provided American Civil War veterans with generous pensions and expanded the list of eligible recipients to include noncombatants and the children of veterans. Grover Cleveland had vetoed a similar bill in 1887. It was criticized as the "Billion Dollar Congress'" for its lavish spending and, for this reason it incited drastic reversals in public support that led to Cleveland's reelection in 1892. Other important legislation passed into law by the Congress included the McKinley tariff, authored by Representative, and future President, William McKinley; the Sherman Antitrust Act, which prohibited business combinations that restricted trade; and the Sherman Silver Purchase Act, which required the U.S. government to mint silver. The last two were concessions to Western farmer interests in exchange for support of the tariff and would become central tenets of the Populist Party later in the decade. They were authored by Senator John Sherman. The Fifty-first Congress was also responsible for passing the Land Revision Act of 1891, which created the national forests. Harrison authorized America's first forest reserve in Yellowstone, Wyoming, the same year. Other bills were discussed but failed to pass, including two significant pieces of legislation focused on ensuring African Americans the right to vote. Henry Cabot Lodge sponsored a so-called Lodge Bill that would have established federal supervision of Congressional elections so as to prevent the disfranchisement of southern blacks. Henry W. Blair sponsored the Blair Education Bill, which advocated the use of federal aid for education in order to frustrate southern whites employing literacy tests to prevent blacks from registering to vote. November 2, 1889: North Dakota and South Dakota were admitted as the 39th and 40th states. November 8, 1889: Montana was admitted as the 41st state. November 11, 1889: Washington was admitted as the 42nd state. May 2, 1890: Oklahoma Territory was organized. July 3, 1890: Idaho was admitted as the 43rd state. July 10, 1890: Wyoming was admitted as the 44th state. The count below identifies party affiliations at the beginning of this Congress. Changes resulting from subsequent replacements are shown below in the "Changes in membership" section. Six new states were admitted during this Congress, and their Senators and Representatives were elected throughout the Congress. Senators were elected by the state legislatures every two years, with one-third beginning new six-year terms with each Congress. Preceding the names in the list below are Senate class numbers, which indicate the cycle of their election. In this Congress, Class 1 meant their term began in the last Congress, requiring reelection in 1892; Class 2 meant their term began in this Congress, requiring reelection in 1894; and Class 3 meant their term ended in this Congress, requiring reelection in 1890. (2) Jonathan Chace (R) Resigned April 9, 1889. (2) New seats South Dakota achieved statehood November 2, 1889. (1) New seats Montana achieved statehood November 8, 1889. First Senator was elected January 1, 1890. (2) Montana achieved statehood November 8, 1889. First Senator was elected January 2, 1890. (2) James B. Beck (D) Died May 3, 1890. (3) New seats North Dakota achieved statehood November 2, 1889. (2) New seats Wyoming achieved statehood July 10, 1890. (1) Wyoming achieved statehood July 10, 1890. Official Congressional Directory for the 51st Congress, 1st Session. Official Congressional Directory for the 51st Congress, 1st Session (1st Revision). Official Congressional Directory for the 51st Congress, 1st Session (2nd Revision). Official Congressional Directory for the 51st Congress, 2nd Session. Official Congressional Directory for the 51st Congress, 2nd Session (Revision). The United States House of Representatives elections in California, 1888 was an election for California's delegation to the United States House of Representatives, which occurred as part of the general election of the House of Representatives on November 6, 1888. Republicans and Democrats each swapped a district. The 1888 United States elections occurred during the Third Party System, and elected the members of the 51st United States Congress. North Dakota, South Dakota, Montana, Washington, Idaho, and Wyoming were admitted during the 51st Congress. This election was the first time that one party had won a majority in both chambers of Congress since the 1874 elections.In the Presidential election, Democratic President Grover Cleveland was defeated by Republican former Senator Benjamin Harrison of Indiana. At the 1888 Republican National Convention, Harrison was nominated on the eighth ballot, defeating Ohio Senator John Sherman, former Governor Russell A. Alger of Michigan, and several other candidates. As in 1876, the Republican candidate won the presidency despite the Democratic candidate's greater share of the popular vote. This situation would not be repeated until the 2000 election. Despite the popular vote margin, Harrison won a comfortable majority of the electoral college, and took most of the states outside the South. Despite the close presidential race, Republicans picked up several seats in both houses of Congress. Republicans won major gains in the House, re-taking the majority for the first time since the 1882 elections. In the Senate, the Republicans won major gains, growing their majority in the chamber. Frederick Lansing (February 16, 1838 – January 31, 1894) was a U.S. Representative from New York. George Wesley Atkinson (June 29, 1845 – April 4, 1925) was the 10th Governor of West Virginia, a United States Representative from West Virginia and a Judge of the Court of Claims. Gilbert Lafayette Laws (March 11, 1838 – April 25, 1907) was an American politician, newspaper publisher and businessman. He served as the Nebraska Secretary of State and as a member of the United States House of Representatives during the 1800s. James Patton Flick (August 28, 1845 – February 25, 1929) was a two-term Republican U.S. Representative from Iowa's 8th congressional district in the Gilded Age. Born in Bakerstown, Pennsylvania, Flick moved with his parents to Wapello County, Iowa, in 1852 and to Taylor County, Iowa in 1857. He attended the common schools. Following the outbreak of the American Civil War he enlisted in Company K, 4th Iowa Volunteer Infantry Regiment, as a private soldier and served from April 3, 1862, to September 4, 1864. Following the war, he served as Recorder of Taylor County in 1869 and 1870. After studying law, he was admitted to the bar in 1870 and commenced practice in Bedford, Iowa. He served in the Iowa House of Representatives in 1878 and 1879, then served as district attorney of the third judicial district of Iowa from 1880 to 1886. In 1888 Flick was elected as a Republican to the U.S. House seat for Iowa's 8th congressional district. After serving in the 51st United States Congress he was re-elected in 1890, surviving the Democratic Party's first landslide victory since the Iowa Republican Party was founded. He then served in the Fifty-second Congress. In all, he was in Congress from March 4, 1889 to March 3, 1893. In 1892, he was not a candidate for renomination. After returning to Iowa, he resumed the practice of his profession in Bedford, until his death there on February 25, 1929. He was interred in Bedford Cemetery. John Charles Tarsney (November 7, 1845 – September 4, 1920) was a politician from the U.S. state of Missouri. Tarsney was born in Medina Township, Michigan, and attended the common schools. During the Civil War, he enlisted in the Fourth Regiment, Michigan Volunteer Infantry, in August 1862, and fought and was captured at the Battle of Gettysburg. He was imprisoned at Andersonville Prison and Camp Lawton, but escaped from the latter prison by temporarily taking the identity of a recently deceased soldier who was to be exchanged. Tarsney mustered out of the service in June 1865. He attended high school in Hudson, Michigan, and graduated from the law department of the University of Michigan at Ann Arbor in 1869. He was admitted to the bar the same year and commenced practice in Hudson. In 1872, he moved to Kansas City, Missouri, and served as city attorney of Kansas City in 1874 and 1875. His brother, Timothy E. Tarsney, was a U.S. Representative from Michigan. His sister Mary E. Tarsney married Thomas A. E. Weadock, who became a U.S. Representative from Michigan after her death. John C. Tarsney married a native of Michigan, convent bred. The great trial of Mrs Tarsney's life was the death of all her seven children, none of whom lived to the age of maturity.In 1888, Tarsney was elected as a Democrat from Missouri's 5th congressional district to the 51st United States Congress. He was subsequently re-elected to the 52nd and 53rd Congresses, serving from March 4, 1889, to March 3, 1895. He was chairman of the Committee on Labor in the 52nd Congress. He presented credentials as a member-elect to the 54th Congress and served from March 4, 1895, to February 27, 1896, when he was succeeded by Robert T. Van Horn, who had contested his election. John Charles Tarsney was appointed by U.S. President Grover Cleveland to serve as associate justice of the Supreme Court of Oklahoma Territory in 1896 and served until 1899. That year he returned to Kansas City and resumed the practice of law. He died in Kansas City and is interred in Mount St. Mary’s Cemetery. Tarsney is the namesake of the community of Tarsney, Missouri. Wilson was born in Crawfordsville, Indiana, the son of James Wilson, a U.S. Representative, and his wife, Emma (Ingersoll) Wilson, and was the elder brother of Henry Lane Wilson. He attended the common schools and was a messenger during the American Civil War. Wilson graduated from Wabash College in Crawfordsville in 1874 and studied law, being admitted to the bar in 1878. He commenced practice in Crawfordsville and in 1880 was elected to the Indiana House of Representatives. He was appointed by President Chester A. Arthur as receiver of public monies at Spokane Falls and Colfax in Washington Territory, serving in this position from 1882 to 1887. Upon the admission of Washington into the Union, Wilson was elected as a Republican in the 1888 elections to the House of Representatives as the representative from Washington's at-large congressional district for the 51st United States Congress. 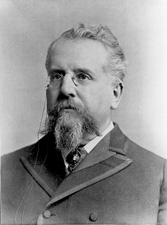 Wilson was re-elected in 1890 and 1892 to the 52nd and 53rd Congresses, serving from November 20, 1889, to February 18, 1895, when he resigned to become a Senator. Wilson was elected as a Republican to the Senate on February 1, 1895, to fill the vacancy in the term commencing March 4, 1893, but did not assume his senatorial duties until February 19, 1895. He lost his bid for reelection to Addison G. Foster in 1898 and left office on March 4, 1899. While in the Senate, Wilson was chairman of the Committee on Indian Depredations during the 54th and 55th Congresses. After leaving the Senate, Wilson published the Seattle Post-Intelligencer. He died in Washington, D.C. in 1912 and was interred in Oak Hill Cemetery in Crawfordsville. John Overton Pendleton (July 4, 1851 – December 24, 1916) was a U.S. Representative from West Virginia. Born in Wellsburg, West Virginia (then part of Virginia), Pendleton moved with his parents to Wheeling, West Virginia (also then part of Virginia), in 1851. He attended Aspen Hill Academy, Louisa County, Virginia from 1865 to 1869, and Bethany College, West Virginia from 1869 to 1871. He was admitted to the bar and commenced practice in Wheeling, in 1874. He was an unsuccessful Democratic candidate for State senator in 1886. He presented credentials as a Democratic Member-elect to the 51st United States Congress Congress and served from March 4, 1889, to February 26, 1890, when he was succeeded by George W. Atkinson, who successfully contested the election. Pendleton was elected as a Democrat to the 52nd and 53rd Congresses (March 4, 1891 – March 3, 1895). He served as chairman of the Committee on Private Land Claims (Fifty-third Congress). He was an unsuccessful candidate for renomination in 1894. He resumed the practice of law in Wheeling, W.Virginia, and died there December 24, 1916. He was interred in Greenwood Cemetery. This is a complete list of members of the United States Senate during the 51st United States Congress listed by seniority, from March 4, 1889, to March 3, 1891. Order of service is based on the commencement of the senator's first term. Behind this is former service as a senator (only giving the senator seniority within his or her new incoming class), service as vice president, a House member, a cabinet secretary, or a governor of a state. The final factor is the population of the senator's state.Senators who were sworn in during the middle of the Congress (up until the last senator who was not sworn in early after winning the November 1890 election) are listed at the end of the list with no number. This is a chronological, but incomplete, list of United States federal legislation passed by the 1st through 56th United States Congresses, between 1789 and 1901. For the main article on this subject, see List of United States federal legislation. Additional lists can be found at List of United States federal legislation: Congress of the Confederation, List of United States federal legislation, 1901–2001 and List of United States federal legislation, 2001–present. This is a complete list of members of the United States House of Representatives during the 51st United States Congress listed by seniority. As an historical article, the districts and party affiliations listed reflect those during the 51st Congress (March 4, 1889 – March 3, 1891). Current seats and party affiliations on the List of current members of the United States House of Representatives by seniority will be different for certain members.Seniority depends on the date on which members were sworn into office. Since many members are sworn in on the same day, subsequent ranking is based on previous congressional service of the individual and then by alphabetical order by the last name of the congressman. Samuel Merritt Stephenson (December 23, 1831 – July 31, 1907) was a politician from the U.S. state of Michigan. Samuel Prather Snider (October 9, 1845 – September 24, 1928) was a Representative from Minnesota. He was born in Mount Gilead, Morrow County, Ohio and attended the public schools, the local high school at Mount Gilead, Ohio, and Oberlin College, Ohio. During the Civil War he enlisted as a private soldier in the Sixty-fifth Regiment, Ohio Volunteer Infantry. After the war he engaged in commercial pursuits in New York, moved to Minnesota in 1876 and settled in Minneapolis. He organized and built the Midland Railway in southern Minnesota and engaged in agricultural pursuits and the mining of iron ore.
he was a member of the Minnesota House of Representatives 1884–1888; was elected as a Republican to the 51st United States Congress (March 4, 1889 – March 3, 1891). He was also unsuccessful for reelection in 1890 to the 52nd congress. He was a delegate to the Republican National Convention in 1892. He retired and resided in Minneapolis until his death, interment was in Lakewood Cemetery. Solomon Gilman Comstock (May 9, 1842 – June 3, 1933) was a U.S. Representative from Minnesota as a member of the 51st Congress of the United States of America. These are tables of congressional delegations from Arkansas to the United States House of Representatives and the United States Senate.